Sjoerd Jongens met with an accident in the early morning of wednesday november 12th, 2008. He suffered severe head injuries – possibly caused by a stroke which resulted in a fall off his bike. He did not awake from his coma. Sjoerd passed away in the night of that same wednesday. I worked with Sjoerd for five years when I was a hired Linux consultant at Greenpeace International. 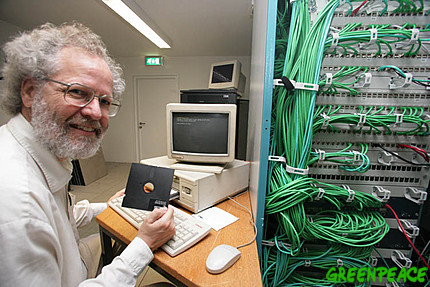 Sjoerd was the driving force behind the design and maintenance of Greenpeace’s global network infrastructure. The Greenpeace archive has a nice timeline of this: http://archive.greenpeace.org/history.html He was a Linux enthousiast and a man of principles (easily mistaken for ‘grumpiness’ if you did not know him well enough). After I ended my assignment at Greenpeace we stayed in touch and had regular conversations about Linux, Greenpeace and Australia (the country where he intended to spend the last part of his life). It is a sad day today. Sjoerd, it is awful to see you go like this. This page will remain so that you are remembered. The Greenpeace weblog honors him as well – go read it. Posted: 13 November, 2008 in Me. I too worked with Sojo. We had an enjoyable year together on Macquarie Island. I thank Sojo sincerely for the ham skeds with my family at home in Australia. Unfortunately we only renewed our contact shortly before his passing. In 2009 the Australian government decided to name one of the islands off the coast of Antartica after Sjoerd. The “Jongens Island” is visible from Mawson Station where Sjoerd spent his first antarctic winter. His friend Tom Maggs made this come true.